We're coming to suspect that Ben Kraus and his team at Bridge Road are operating a series of hidden underground breweries as well as the one that you can see when you visit their Beechworth home. How else to explain the fact that we seem to list plenty of new releases from them (not to mention the regulars they keep pumping out in-house and the small batches that only go to Posse members) and yet still seem to miss some? Either that or Fairy Gary has been spreading some magical beer dust over the Victorian High Country. There were a couple of small batch brews from Bridge Road on offer at the recent Bendigo on the Hop and, when we called in to Beer DeLuxe Hawthorn the other day, yet another had just been tapped. 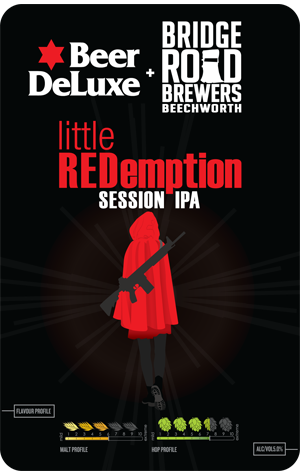 This last one was Little REDemption, a red session IPA. It's most definitely red and we'd wager the "session" tag is as much down to its balance and drinkability as its 5 percent ABV (not the lowest in the world of session IPAs). According to Beer DeLuxe beer man Derek Cowes, the idea was to create "a very hoppy American red ale approaching the hop character of a IPA but still with the ABV expected of a Red Ale." They did so with a selection of notoriously fruity New World hops – El Dorado, Nelson Sauvin, Topaz and Enigma – which combine with the specialty malts for a tropical fruit salad meets rich biscuity and caramel malt kind of a thing. A kind of a thing that's worth hunting down.